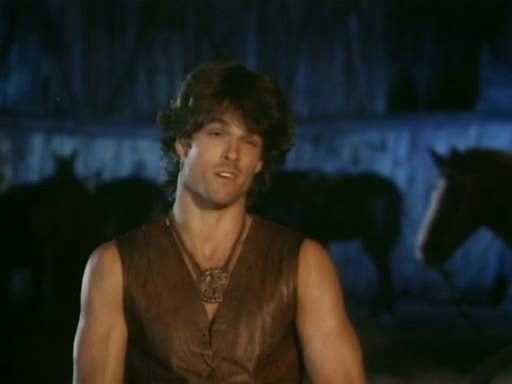 In keeping with my theory that a character's characteristics are less, 'things he can do,' and more, 'ways he affects the story,' here's my rundown of the characteristics of Deathstalker - pretty much the best B movie hero there is. Always gets mixed up with princesses. Any female NPC Deathstalker meets has a certain likelihood of being a princess. Roll this skill each time you meet a female NPC (unless it’s already succeeded) – success means she turns out to be a princess. Note this would increase the reward for helping her greater, as well as the consequences for irritating her. Tight Pants of Irresistibility. Any female Deathstalker meets is immediately attracted to him. As above, roll this trait to see whether she reacts to this sensation with slavish loyalty or self-loathing and passive aggression. Can Hide Anywhere. It’s not that Deathstalker is actually good at hiding – it’s just that he generally goes unnoticed, even when he hides in really obvious places. Roll this skill in circumstances where other characters wouldn’t even get a roll. Wisecracks. Deathstalker is able to counter any fear penalty by making a wisecrack. GM can add a bonus/penalty to the roll depending on the quality of the player’s wisecrack. Cheesy Fight Moves. The haters may chalk Deathstalker’s style up to second-rate choreography, but we know the truth: cheesy fighting is his superpower! If the player can manage a ridiculous, scenery-based move (leaping on top of a bookcase for no good reason, rope-swinging toward his enemy while his enemy rope-swings toward him, etc.) he gains an attack bonus. Unlucky in Love. Playing Deathstalker is an exercise in the axiom that you can’t have it all. Whenever he’s about to take a mortal blow, it somehow gets diverted onto his current love interest.